Georgia: How Closely Should the State Embrace the Church? Twenty-five years after regaining its sovereignty, the South Caucasus country of Georgia faces another question about independence — this time, about that of the state from the Georgian Orthodox Church, the country’s main religious faith. The official answer from both the Church and state is that they are, indeed, independent. 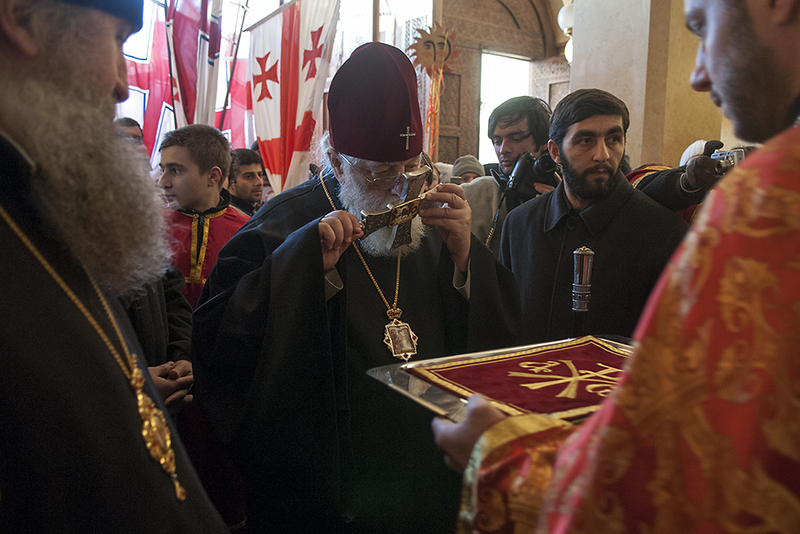 A 2002 agreement grants the Georgian Orthodox Church, the faith of roughly 83 percent of Georgia’s 4.3 million citizens, an advisory role to the government, but without the status of a state religion. Nonetheless, some contend, the government-financed Church, exempt from taxation, is a state religion in all but name. Eka Chitanava, director of the Tolerance and Diversity Institute, contends that since 1992, when the Church regained legal recognition, the modern Georgian state has used the Church for “legitimacy” and the Church, in return, has gained “a lot of financial resources” — aside from a tax-exempt status, about 25 million laries (over $11.3 million) per year, in recent budgets. Arguably, this is a matter of national identity — since its founding in the 4th century, the Church has outlasted many Georgian governments — as well as votes. At official celebrations of Georgia’s May 26 Independence Day in Tbilisi, 83-year-old Patriarch Ilia II sat between President Giorgi Margvelashvili and Prime Minister Giorgi Kvirikashvili on the reviewing stand. But critics charge that the state had gone too far in following the Church’s lead. A state agency on religious affairs, answerable to the prime minister’s office, has proven “a rather Soviet structure to control religious structures,” Chitanava argued. Cases of Islamophobia have not been investigated as promised, she contended, nor have those priests who violently attacked a 2012 anti-homophobia rally been punished. After the patriarch stated last December that he should be allowed to amnesty prisoners, Minister of Corrections Kakhi Kakhishvili agreed, and the government pledged further action. A government initiative to change the constitution to define marriage as uniquely heterosexual also has been attributed to the Church, which states that “secularism and moral relativism” now threaten that institution. Yet while some activists and journalists question this relationship, that criticism vanishes when it comes to cooperation on most secular Georgians’ ultimate goal — membership in the European Union. In this campaign, the Church, arguably Georgia’s most trusted public institution, can prove to be a strong political ally. Both the government and EU member states appear to recognize that. An ongoing project financed by the British and Dutch embassies, and organized by the Tbilisi-based Center for Development and Democracy and the Patriarchate’s Education Center, focuses on educating priests about the EU for them, in turn, to educate their parishioners. Russian media and some conservative priests have led parishioners to believe that membership in the EU would entail acceptance of homosexual marriages, a nonstarter for most Georgians, and, ultimately, enfeeble the Church. To that end, the EU has financed the publication of a book by one Georgian non-profit, the 21st Century Union, on the legal status of Orthodox Churches in nine EU members (Bulgaria, Cyprus, Estonia, Finland, Greece, Latvia, Lithuania, Poland and Romania). Bakradze’s office contributed unspecified assistance. “The point is that the Orthodox Church is a great supporter of the EU for Georgia,” the minister told attendees at the May 23 presentation of “The Orthodox Church in European Union Member States.” Plans for its distribution were not detailed. Many, of course, dispute the depth of the Church’s EU enthusiasm, instead positing that its sympathies lie more with conservative, Orthodox Russia — a charge senior clergy hotly deny. Roughly a year before Georgia’s May 26, 1918, declaration of independence, the Church asserted its own independence from the Russian Orthodox Church, regaining the right to self-rule it had lost with Tsarist Russia’s takeover of Georgia in the early 19th century. For all the values it shares with the Russian Orthodox Church as “part of the world Orthodox Church,” it is not eager to kowtow to Moscow. In an impromptu response on May 18 to rights-researcher Chitanava, Father Giorgi Zviadadze, protopresbyter and rector of the Tbilisi Spiritual Academy, denounced claims that the Church is a “tool of Russian propaganda” as “based on ignorance.” They willfully overlook Church policy and meetings with representatives of both the EU and North Atlantic Treaty Organization, he said. “We are teaching our Orthodox teachings. We don’t use propaganda, or any … country’s church [to influence parishioners]” he stormed, in reference to the Russian Orthodox Church. “The only instrument the Church uses is the word of the Lord,” he said of the Bible. Mistakes, he added, would be flagged.